Posted by Mrs Weird Scientist in Animals, Dinosaurs, Environment, Evolution, Think About It. Sssssssh. Believe it or not, dinosaur breath can tell us quite a bit about how dinosaurs evolved and what sort of life they experienced. Led by Dr Jonathan Codd, a team at the University of Manchester in the United Kingdom did some investigating and found that theropod dinosaurs had respiratory systems that were similar to modern marine birds and wildfowl. If you’re not too well versed in dinosaur lingo, then ‘theropod’ might be a new word for you. Theropods were the quick-moving, massive, mostly carnivorous dinosaurs that roamed Earth. They also had powerful legs and clawed hands. The results of the investigation are really cool because they give us some insight into how dinosaurs actually breathed. The full details of the research were published in the Proceedings of the Royal Society B: Biological Sciences. Credit: Jonathan Codd of the University of Manchester. Let the battle begin! 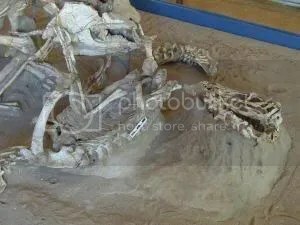 This picture shows a Protoceraptops fighting it out with a Velociraptor mongoliensis. The lengthy uncinate processes can be seen on the rib cage of the velociraptor. There already are studies showing that dinosaurs were the direct ancestors of birds but scientists are still trying to find out to what extent anatomical features are shared. So, even if you already knew that there were a bunch of avian characteristics in dinosaurs, there is still lots to learn as new features are identified – like dinosaur breathing structures! Much of what we know is built upon heaps of studies. We basically keep adding new information to the pot – sometimes this information makes us say ‘Wow, the old idea was way off!’ Other times it extends what we know by explaining it in more detail. In this case, we’re simply adding new information to the mix! Our work on modern birds has shown that the way these animals breathe is more complex than originally thought. The uncinate processes are small bones that act as levers to move the ribs and sternum during breathing. Interestingly, these structures are different lengths in different birds – they are shortest in running birds, intermediate in flying birds and longest in diving birds. The dinosaurs we studied from the fossil record had long uncinate processes similar in structure to those of diving birds. This suggests both dinosaurs and diving birds need longer lever arms to help them breathe. Finding these structures in modern birds and their extinct dinosaur ancestors suggests that these running dinosaurs had an efficient respiratory system and supports the theory that they were highly active animals that could run relatively quickly when pursuing their prey. Ultimately, the uncinate processes allowed the dinosaurs to move around very fast, which meant they could rapidly capture prey. Right now though, you’re probably breathing a sigh of relief that this article wasn’t about bad dinosaur breath! With all the raw meat they ate, I have a feeling it would have been really gross. Yuck!